The modern shaker style kitchen in The Water Burrow has everything you need to cook the fresh fish you may have caught from the water that surrounds you or bought from the renowned fresh fish stall on the Quay. If you want a break from the oven then the delightful Haven House Inn, a few steps away, serves delicious food, seafood being a speciality. 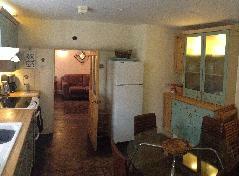 Utilities include a filter coffee machine, microwave, oven, hob, fridge freezer and a washer/dryer. You can sit around the table eating or planning the next day's activities.